We are into that time of year of fall events and fall festivals! And so we wanted to give you some tips and ideas to make sure that your family can participate in all these fun activities, even if you have a child with special needs. 1. Find special needs-friendly events. Search for events in your area that are specifically for kids with special needs. Try doing a Google search for these, or a Facebook search. As the special needs community grows, many businesses and companies are putting on events specifically for our sensory kiddos. So look for those. We try to stay on top of these and share them with you through our social media platforms, but if you find some in your area be sure to tag us and let us know about it! That way we can help to get the word out! If you’re going to go to an event for the general population, see if you can check out the venue ahead of time. See if you can find out how crowded you can expect it to be. Talk to people who have been there before. We don’t want to just throw our kids into a situation that will be overwhelming for them. If you’ve seen our videos and blogs before you’ll know that we always recommend that whatever event you’re planning to go to, whether it’s a football game, the mall, or a fall activity, always prepare in advance. Get pictures of the venue, tell your kids a story about the activity in advance, ease some of that anxiety beforehand by letting them feel that they know exactly what to expect. 3. Have your own event. If you know other families who have special needs kids, maybe you could get together and have a backyard mini fall festival. If you know your kiddo is going to be too overwhelmed for some of the other options, this can be a great solution. What to do about fall events is something you can always work through with your therapist. If you have specific questions about some of these activities you find at a fall festival (hayrides, picking up pumpkins, etc. ), your therapist will be able to guide you through the best ways to approach these things for your kiddo. 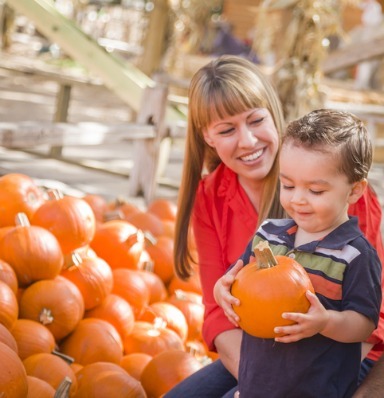 Remember, if you know of any fall festivals in the area that cater to kiddos with special needs, let us know about it! We’d love to get the word out!